There seems to be an age old struggle between two forces in people’s mind that is hindering many from achieving their full potential; this is the apparent contradiction between being ambitious versus being content. Both qualities are well respected and even encouraged to have, however when they are brought together in one person’s mind or heart, there seems to be a conflict. As you can expect, this mind-set is dangerous for the Ummah’s growth. InshaAllah in this article we will try to help resolve this dilemma and show you that being ambitious and being content are two faces of the same coin and that in fact to become a truly successful ProductiveMuslim, you need to have both! 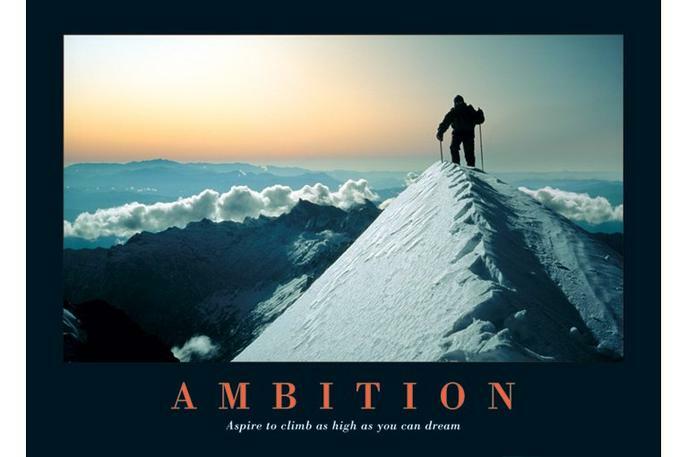 Ambition: drive, determination, enterprise, initiative, eagerness, motivation, resolve, enthusiasm, zeal, hunger, commitment, a sense of purpose; aspiration, intention, goal, aim, objective, object, purpose, intent, plan, desire, wish, design, target, dream. Contentment: Contentedness, content, satisfaction, gratification, fulfilment, happiness, pleasure, cheerfulness; ease, comfort, well-being, peace, equanimity, serenity, tranquility. As you can see, from a definition point of view, there isn’t much of a contradiction between the two concepts. The states of being “ambitious” and “content” seem to serve different aspects of our drive to be the best – one is driving us (ambition), the other is making us enjoy the ride (contentment)! Where does the contradiction lie? The contradiction lies in our misunderstanding that being content, means not wanting to achieve more; and that being ambitious to achieve more, is a sign that you’re not content. This is definitely not the case. So how can we resolve this idea? We can now understand that we should be ambitious, however this ambition is to serve the person’s ultimate goal and that is to gain Allah’s pleasure and entering the highest part of Jannah. The above clearly demonstrates that contentment should be related to the dunya matters and can be reconciled with being ambitious in this life. This example of Abu Huraira (may Allah be pleased with him) shows that he was ambitious enough to memorize the ahadith of the Prophet (Peace and blessings be upon him), yet he was also content with his restricted provision in this world. Be content with your provision in this dunya. But be ambitious about your akhirah and never be complacent about your good deeds done for Allah. Aim to achieve more in order to please Allah, in your own practice of Islam and in your service to the Ummah – strive for more (sincerity, quality, quantity). Don’t be afraid to be ambitious for our Ummah in this dunya, and for yourself in the akhirah.